With the deadlines for Globally Harmonized System (GHS) label compliance now past for chemical manufacturers, distributors and end users, OSHA has some stiff fines planned for those not yet with the program. “For any stragglers not yet GHS-label compliant, OSHA fines and penalties are expected to increase 80 percent,” says Mark Howell, owner of Howell Safety and Training Solutions, a Jonesboro, AR-based safety and risk-management consulting company. “The maximum fine is expected to rise from $7000 per violation to $12,600 per violation, and for more serious issues from $70,000 to $127,000 per violation.” End users who may not yet be fully GHS-label compliant, or who may want to streamline their compliance process, will find that easy GHS labeling options can reduce complexity and make production safer. GHS compliance is required for chemical formulations purchased in bulk containers. Containers requiring GHS-compliant labeling can vary in size from 55-gal. drums down to small test vials. In an industrial setting, chemical formulations that could require GHS labeling include industrial primers, coatings, sealants, lubricants, greases, cutting oils, rust removers, degreasers, surfactants, disinfectants and sanitizers. 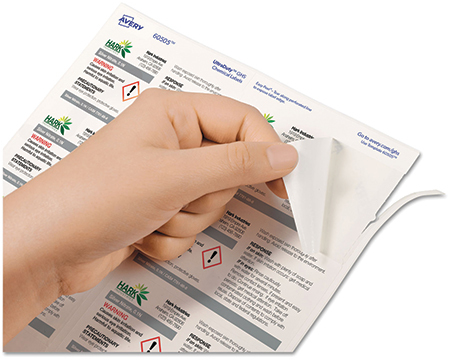 One labeling solution comes from Avery: UltraDuty GHS Chemical Labels. The industrial-grade labels, constructed with a marine-grade waterproof adhesive, resist chemicals, tearing and abrasion. And, Avery’s Design & Print GHS Wizard allows employees to create and print their own GHS and HMIS labels from pre-designed templates.